On the long car journey north to Humberside for our match with Hull City, one thing was agreed; this was a “must win” game. Our main title rivals Manchester City had easily won at home to West Brom on the Saturday, thus narrowing the gap at the top of the league table to three points, although Arsenal were closing in too. With ten games left for us this season, there were still many points up for grabs. Although the end of the campaign seemed somewhat nearer, over a quarter of the season was still left to play. There were obviously many points to win, but also many points to lose. After faltering performances against PSG and Southampton at Stamford Bridge, the Chelsea army were travelling north with a hope that we would see a much-needed win. This was no time for the weak-hearted, among players or supporters. Despite the long day ahead, it felt good to be back on the road following the team once again. It was, in fact, the second football away day of my weekend. On the Saturday, I was at a loose end and decided to head down to the neighbouring county of Dorset to watch my local team Frome Town play at Dorchester Town in a relegation dog-fight in the Southern League. I thoroughly enjoyed myself; it was a glorious day for football, with the early spring sun combining with clear skies overhead. I watched from the very rear row of the impressive main stand of Dorchester’s neat stadium, The Avenue. I remember that Chelsea, in October 1990, were the first team to play at Dorchester’s new ground, although I didn’t attend. I was dismayed when Dorchester went ahead with a quarter of an hour to go, but ex-Bristol Rovers forward Lewis Haldane equalised for Frome with five minutes to go. I roared from my seat and punched the air; ah, I love how the simple pleasure of a goal can produce such emotion. It was a well-deserved draw. I had bumped into a handful of friends at the game. It was a super day out. Unbeknown to me at the time, Dorchester’s assistant manager is Nick Crittenden, who played a couple of games for Chelsea in around 1997. The chap filming the match for the home club was positioned only a few yards to my left. My shout of “yes, come on” when Haldane scored can clearly be heard at 7 minutes, 49 seconds. The second day of my footballing weekend began at around 7.30am on the Sunday when I collected PD Wetherspoon and Lord Parky soon after. The two of them were soon opening up the first of their cans of cider. We were on our way. This was a bittersweet trip for me. At the time of our game at Hull City in January last year, my mother was in relatively good health. However, just after – the following Friday – Mum was stricken with arthritis and her life changed. As is my wont, I always seem to remember landmark events in my life with football matches; Hull City on Saturday 11th January 2014 was one of them. How I wished that things could have stayed the same as on that day, with my mother in robust health, contented. As I ate up the miles on my way to Kingston-upon- Hull, my dear Mum would never be far from my thoughts. At 4pm, I set off and tried my best to get down to Stamford Bridge for the Reading game. I was on target, but hit some nasty traffic around Luton, and parked-up just as I heard the crowd roar a Michael Ballack goal. I got in just before half-time and my unbeaten home run – which eventually stalled at 240 games – was able to continue. This would be my third visit with Chelsea. I was hoping that I would get a chance to take a look around the city’s marina before the game; Hull is not known as a particularly interesting city, but I was hoping to unearth a few hidden jewels. Last season, on that fateful day, I was fed-up that I had travelled all that way “just” for ninety minutes of football. I’m always a bit dismayed by stereotypical views of cities in the north being grim and unwelcoming. I was hoping that Hull might surprise me. Last season, I mentioned that Hull was where one of my favourite bands, Everything But The Girl, were formed. It was also where The Housemartins – who morphed into The Beautiful South, an ironic stab at London and the Home counties by the band members – were formed at around the same time. On this day of football, I was hoping for anything but London 0 Hull 4. Despite some speed restrictions north of Nottingham on the M1, we made good time and I was parked-up in the city centre at around 12.15pm. It had taken four hours and three-quarters. There would be similar travel times for the majority of other Chelsea fans. We based ourselves in a large, but bland, city centre pub called “The Admiral Of The Humber.” Pints of cider at just £2.25 made PD and Parky smile. We were joined by two-transatlantic visitors; Tuna from Atlanta and Luke from Boston. Luke was back in England for his father’s funeral, and it was the first time that I had met him, having befriended me on Facebook via a couple of other mates in Boston. Luke grew up close by, in Wiltshire, before heading off to fresh fields. Tuna, Luke and I left the drinkers to it, watching the Liverpool vs. Manchester United game, while we visited the marina on a quick little walking tour. The weather was perfect and it was good to get out of the pub for a while. We chatted about all sorts, and were impressed with a few quaint side streets. A historic pub – red brick, real ales, far more interesting than the other one – was highlighted for our next visit. At 3pm we took a cab to the stadium. The Chelsea contingent this season was wrapped around a corner flag, rather than being right behind the goal; Alan, Gary and I took our seats a few rows back. The KC Stadium is a pleasing stadium, with a main stand that rises over the other three sides, like a mini version of The Etihad. The locals love their amber and black bar scarves. Manchester United had won at Anfield, and closed in on us too. The pressure was on. After just two minutes, the ball was worked to Eden Hazard, who advanced on goal. With a swing of his left leg, he hit a perfect shot past McGregor in the Hull goal. I was right in line with the flight of the ball, as I often am. Get in. We were one up and flying. Hull then had a great chance to level, with Hernandez breezing past a static defensive line, but Thibaut Courtois blocked the shot with ease. 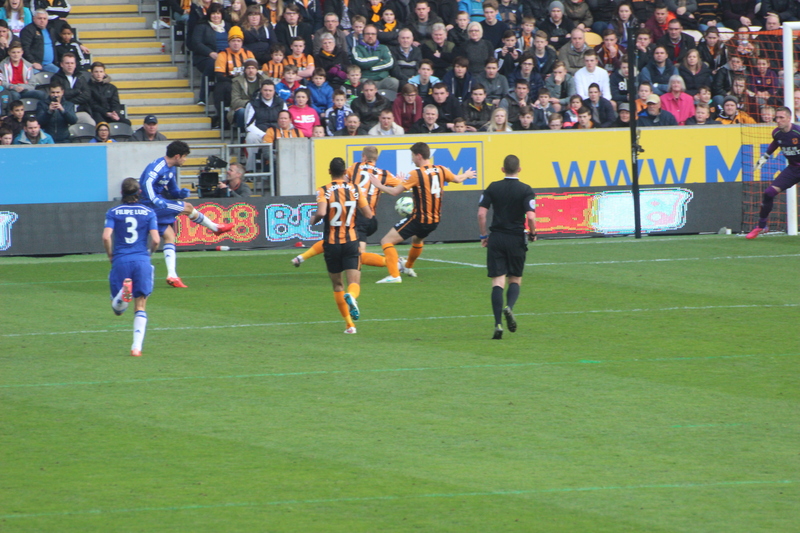 After nine minutes, Cesc Fabregas picked out Diego Costa, who ran at the Hull defence down the left flank. I was expecting a cross, but instead, he curled the ball past the ‘keeper and the ball nestled inside the far post. It was, frankly, a relief to see our striker back among the goals. Two up and flying high. This was ridiculous; two shots, two goals. There was talk of another “Swansea” and a repetition of our five goals. We then appeared to go to pieces. What a strange sport this can be. From a position of strength, and with our confidence presumably high, we collectively collapsed. Hull were excellent, moving the ball well, and causing panic in our defensive third. Our midfield were second best and the anxiety within the away contingent grew with each passing minute. On twenty-seven minutes, Robertson easily escaped a poor challenge by Ivanovic and rattled in a perfect low ball in to the six yard box. The prod from Elmohamady just beat out an attempted clearance from Filipe Luis and Hull were back in the game. Just one minute later, yet more calamity. Ivanovic played a back-pass back to Courtois, but instead of a “safety first” approach, which could have involved him hacking the ball off for a throw, our young ‘keeper attempted to play the ball back to Ivanovic, but Hernandez nipped in to equalise. The home crowd roared. Egg on faces. Ugh. There was talk of tough games against Arsenal – not out of the title race – and Liverpool and Manchester United. There was talk of our lead being frittered away. Our collapse was mysterious; everywhere in the team, with maybe one or two exceptions, players were poor shadows of themselves. We needed another invigorating team talk from the manager. Thankfully, after the break, we enjoyed most – if not all – of the early possession and we were able to threaten the Hull goal. Chances came and went, but McGregor wasn’t overly tested. We were at last finding space out wide, but a goal would not come. Ivanovic, Matic and Fabregas did not impress. All three were poor. With one mistimed challenge by Ivanovic, both Gary and myself likened the splayed legs of our big Serbian to that of Devon Loch, the horse who bizarrely stumbled, mid canter, on the homeward segment of the Grand National. A bad omen, surely, as we approached the final few hurdles of this long campaign. Oscar came on for Ramires. Then, against the run of play – completely – Hull broke away and a piece of sublime football followed. Thibaut Courtois, making up for his previous error, made three amazing saves from Elmohamady, Livermore and Ramirez in the same move. It was an astounding succession of saves. It reminded me of Jim Montgomery’s saves in the 1973 Cup Final. Loic Remy – the oddly forgotten man – came on for Diego Costa. Within two minutes, Willian – increasingly involved down below me – played in Remy who struck a low shot towards goal. The hapless McGregor was able to block, but not fully, and the ball had just enough momentum to roll slowly over the line. A quiet away following were now roused and we turned the air blue. A few late scares came to nothing. At 6.45pm, we left the city, with Tuna driving right behind me. The sun was setting beyond the Humber Bridge, the crescent moon high, the sky clear. Again, another long journey lie ahead, and I reached home at 11.30pm. It was another four hours and three-quarters on the road. It had been a very strange game of football. We had struggled throughout the game and doubts about our championship calibre would no doubt be raised by those both inside and outside our football club. Our current form is quite poor, and we have nine games left to win our fifth league title. There is worry in the air. However, remember this; in forty-five competitive games this season, we have lost just three. The next nine games will answer that question. This entry was posted in Season 2014-2015 and tagged 1983-1984, 2014-2015, Parents by Chris Axon. Bookmark the permalink.